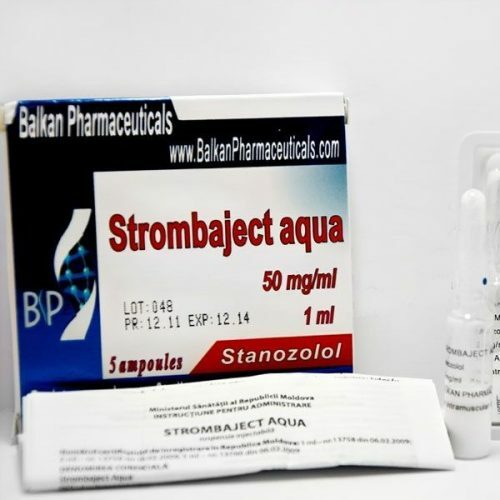 Strombaject Aqua from Balkan Pharmaceuticals – water based injectable Stanozolol. In action it is similar to Winstrol. Strombaject Aqua, as well as any anabolic steroid with Stanozolol as active substance, is used to increase strength without a significant increase in muscle mass. Use of the drug will gain lean muscle and burn body fat. The first steroid based on Stanozolol was developed in the early 70-ies by the company Winthrop Laboratories. Stanozolol is a synthetic derivative of dihydrostestosterone. Initially, the substance was used to improve the quality of cross-country horses, but after FDA approval, Stanozolol began to be used by athletes. Despite the fact that the substance is an antagonist of progesterone, it does not protect the body from harmful exposure to Nandrolone‘s progesterone. The main difference of Strombaject Aqua from the majority of injectable anabolic steroids is its water base (Stanozolol is able to dissolve in water), which determines the mechanism of action and the frequency of injections. Improving muscle relief. Stanozolol is often used bodybuilders on the drying cycle and in the final preparation for a competition. Stimulation of the body to burn fat. Withdrawal of liquid accumulated in the body (further promotes fat burning). Lowering the level of globulin. Globulin – a substance that binds anabolic hormones (it can double the efficiency of lowering the anabolic processes). In practice, the reduction in the level of globulin gives the body a chance to take stronger action of steroids. There may be antiprogesteronic and antiestrogenic effects (but specialists opinions are mixed). Strombaject Aqua has anabolic activity of 320% of testosterone and androgenic – only 30%. The high anabolic index, no conversion to estrogen and safety for liver, makes Stanozolol one of the safest anabolic substances of this nature. The drug gained immense popularity in the bodybuilding due to the fact that its action is fundamentally different from that of the majority of anabolic steroids. Solo Strombaject Aqua cycle has virtually no effect on the body weight, but muscles becomes more pronounced and venous. The substance is indispensable in “dry” cycles. For a set of muscle mass, Strombaject Aqua can be combined with some stronger androgens, such as Anadrol, Testosterone or Methandrostenolone. Such combined cycles offer a significant anabolic effect with lower estrogenic effects on the body. How to take Strombaject Aqua, largely depends on your experience in the use of anabolic steroids, as well as individual performance. For male athletes dosage is from 50 to 100 mg of the drug in the form of injections a day. Women injections are not recommended because of possible side effects. However, there is the oral form of stanozolol and its dosage for women ranges from 5 to 10 mg per day, for men – from 10 to 50 milligrams. Strombaject Aqua cycle varies from 5 to 8 weeks. All dosages are calculated for representatives of power sports. Boxers, athletes and representatives of other species associated with endurance, the minimum recommended dosage is advised. Side effects from Strombaject Aqua are extremely rare. If you do not exceed the recommended dosage and duration of the cycle, from the harmful effects of Stanozolol did not encounter even a woman. In some cases, may increase cholesterol levels in the blood, liver damage (only orally), myocardial hypertrophy or an increase in blood pressure. Strombaject does not aromatize and does not require post-cycle therapy. Numerous positive reviews about Strombaject Aqua testify to the high quality of the product from Balkan Pharmaceuticals. Athletes report an increased power performance with a solo Stanozolol cycle and an increase in the quality of muscle mass when combined with other anabolic steroids.